For those parents who are trying to save a few extra money on the side – you might have dove into DIY projects and have opted to cook food at home rather than eating out. Small changes to one’s lifestyle, especially to an entire family, can help you save money and budget your spending accordingly. Which might make you consider attempting to groom your children at home rather than at the beauty salon – because it can get quite expensive. For a few snippets here and there – no styling – can cost your wallet a pretty penny for a trim that you could have done at home. So if you are planning on snipping your child’s hair at home, please remember these important points before you reach for the scissors. Before your child is at least 6 months old, they cannot sit up straight on the chair – which means you won’t be able to cut their hair comfortably. And you can end up hurting them with a simple twitch in movement. Once they are old enough to sit up on their own, place them on a high chair and help steady them for a few minutes. Dry cuts may be easier, however, they do not guarantee precision. So always remember to wet their hair and brush it gently to get a better understanding of how much you need to cut and how short you at going to start. And always start cutting the hair from the side of the head rather than from the middle – work your way into the middle and always make sure you are moving at an even pace. Avoid cutting their hair too short as the hair on their head helps protect children from the heat, the cold and sunburns. You don’t want your child to start fidgeting while you have scissors in your hand and it’s almost guaranteed that they will get bored from sitting still. So make sure you grab their favourite toy to keep them distracted and entertained while you get the job done. 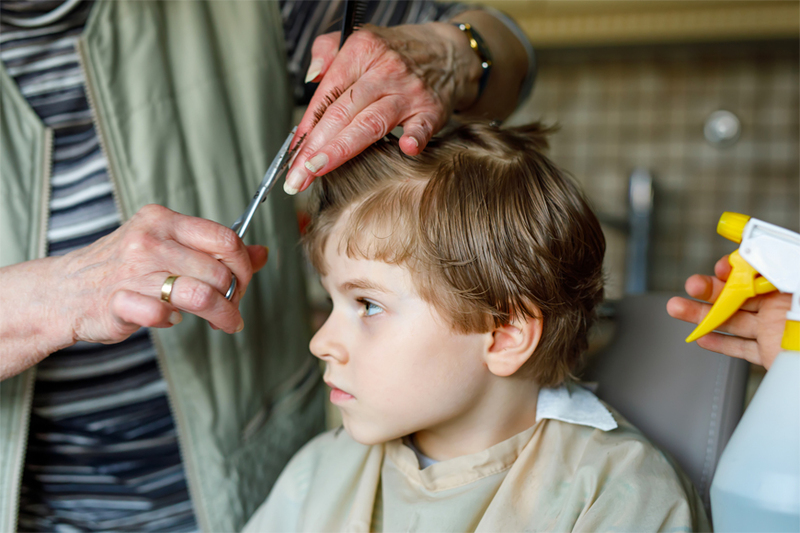 This will help them get used to the idea of cutting hair at home and make them more comfortable with the routine. Massage their scalp and then brush their hair in all directions for a few minutes to relax them. If your child is still young, never use high heat directly on their hair or head. Their scalp is extremely sensitive when they are young and can get damaged by extreme contact of heat.